with roasted grapes and ricotta for lunch my first day. Mermaid and the Ambassador Bridge. Lunch at Jack's in Kingsville, and this burger made my life. I saw an Andy Warhol and it was cool. Even food bloggers eat chili dogs. Art from the Heidelberg Project in Detroit. Oh so good chicken tortilla soup from Stacy's kitchen. My friends surprised me with reservations to Ruby Watchco, in Toronto. door with her backpack. Oh, and the food was amazing, too. At the end of the night I totally wanted to snoop in the kitchen. Walking though Toronto neighbourhoods, I loved seeing peaches everywhere. I wish I could grow hydrangeas like this. Avocado, fresh mint and chocolate ice cream, from Chocolateria. Super awesome doesn't describe it. Dumpling making at Mother's. Get the pan fried pork. Staircase inside the Art Gallery of Ontario. one night. These are filled with a mocha mousse. If only I can bottle this feeling for the rest of summer. Okey dokey. Are you still with me? That's a lot of photos! All were taken with Instagram, which I'm deeply in love with. So let's talk about food for a bit. I should clarify that I barely lifted a finger in the cooking department. Most of my tasks were delegated to chopping and stirring and taste testing. It was perfectly awesome being the guest in kitchens of friends who love food as much as I. 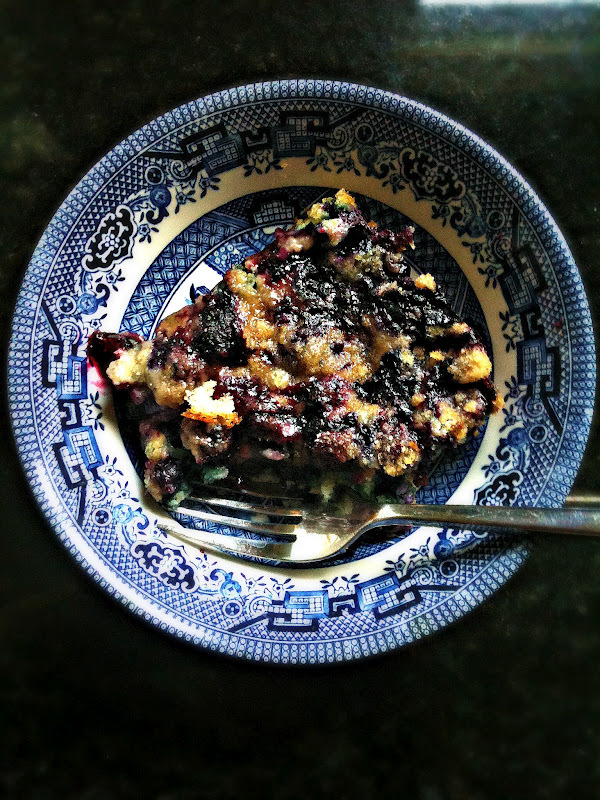 While pouring over cookbooks (yes, that's what we do for fun) this recipe for blueberry buckle was stumbled upon, in Oprah's cookbook no less. Kinda cool in that it has a cakey bottom, fruity middle and buttery crumbly topping, it's perfect for dessert or as you well know, I eat many a dessert for breakfast and this doesn't disappoint. Light and lovely, Stacy made this with fresh and juicy local Ontario blueberries purchased on the side of the road. It doesn't get any better than that. To make the crumble, combine all ingredients in large bowl and break apart with fingers. Refrigerate for a bit. To make the batter, in a medium size bowl or in the bowl of a mixer, cream butter and sugar then add egg. Sift together dry ingredients and add half to the creamed butter, mix then add buttermilk, mix then add rest of dry ingredients. Refrigerate 30 minutes. To prepare filling, combine all ingredients in bowl and stir. Grease one large baking dish with butter. Spread batter on the bottom, then top with blueberry filling, then top with the crumble mixture. Bake in a preheated 350*F oven for 30-40 minutes, until top is browned and filling starts to bubble. Remove from oven and let it cool for about 20 minutes. Serve warm, room temp or cold, for breakfast. Serves 8. Sounds like you had fun! I love the photographs, especially the Warhol. Never had a buckle before, but I would definitely make this. Enjoy the rest of your summer Renee. What a wonderful trip! There's nothing like some solid time with the girls. That's a really cute picture of you...your happiness shines through and I don't even know you! That is a flat out gorgeous photo of you! And those shoes may not have been comfy but they sure are cute, which always goes a long way in my book. Love all the Instagram photos- I didn't know you were on the service but I'll look you up now. Hope you're recovering from your awesome sounding trip well. And terrific looking buckle! I once got lost on THAT 8 Mile too ... not fun. Need to try that buckle immediately! Blueberries are my fav! It's too bad that summer vacation can't last forever! Thank you so much Sara and Lisa! Laura, you know my fear - not fun, nope not at all.